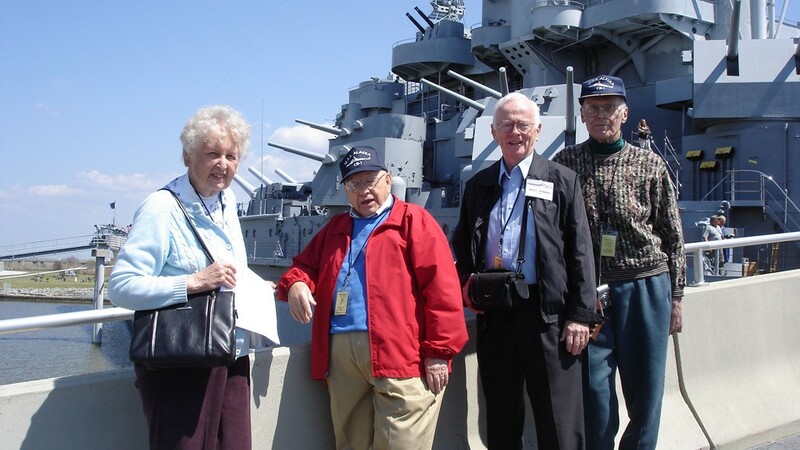 This 28th Reunion of the USS Alaska CB-1 was entirely organized by Jim and Karen Smith. It was most successful because of their efforts. It was indeed a great pleasure having Captain Noble’s son, Comdr. Thomas Noble with us. We also had some “first timers” with us. Our first day was spent greeting people as they arrived. We had use of a beautiful multifunctional room to gather for Hospitality, Breakfasts, Meeting, etc. On Thursday we visited the Naval Air Museum at Pensacola Naval Air Station. During this guided tour we saw all sorts of naval airplanes beginning with the very historic first attempts right down through the world wars. it brought back many memories for our members seeing the planes used during WWII such as an actual Japanese Zero, U.S. Fighter planes, a replica of the Atom Bomb, and lots of others all described in detail. Many know the type of plane before our guide could tell us. Since this is the home of the famous Blue Angels, we were treated to seeing, in formation in the Museum, the latest retired models. Unfortunately they were out of town when we were there, or we could have seen them practice. We had lunch at the Museum Restaurant. That evening we again loaded the bus to the Naval Air Station Officers Club for our Annual Banquet. Our speaker was Pastor Sean LaGasse, and the other guest was Scott Brown, both of Pensacola area. Pastor LaGasse gave a very inspiring talk. Chief Robert McVeigh (Ret.) also gave a nice talk about the World War II Navy Veterans. On Friday we drove about an hour in order to tour the battleship U.S.S. Alabama and WWII Submarine U.S.S. Drum and another air museum. The Alabama tour was a close reminder of our beloved U.S.S. Alaska and those days when the men were your and daring and strong. Having previously been visitors at the U.S.S. Alaska nuclear submarine, the U.S.S. Drum seemed exceedingly small. After touring all the areas above and below deck of the U.S.S. Alabama, and going from stem to stern, we were then served lunch in the wardroom. On board was a group of news people who were working on a project regarding the war in the Pacific, and they interviewed the Chairman and Jim Smith; this segment was viewed on the local TV station — probably one whole minute of the 10 minute interview, but it was exciting. Activities were concluded with dinner and our Annual meeting held in the Hospitality Room. In conclusion, we want to express our sincere thanks to the Crowne Plaza Hotel for their wonderful facilities and meals as well as the hospitality shown to us. Also, our sincere appreciation to Tom McKean of Beach Bum Trolley was responsible for our wonderful trips, tours and lunches. Our sincere appreciation and thanks to David Bowman of the 1st Div. and to James Sutton of the Guest Div. for providing us with all the photos of our Pensacola, Florida renunion. An outstanding job! To save space we had to collage some of the pictures we will add more in the next edition of the NORTH STAR. You can view the photo album of this reunion by clicking here.